I wonder what you would think about this German stamp I discovered yesterday. I've attached scans (below). See the dot between the numerals? Do you think it is an uncatalogued plate error? It definitely looks like a plate / printing variety. I just checked my 40 Pf. (Michel Deutsches Reich # 124), and it has a faint dot, a little lower than where yours is. I checked my un-overprinted 40 Pf. 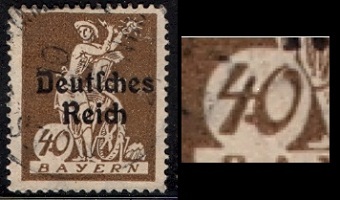 stamp (Michel Bayern # 183), and it has a very tiny dot between the top of the “4” and the “0”. I checked the color illustrations in both Michel and Scott, and as fate would have it, none of the set illustrations show the 40 Pf. denomination! Die übereilte herstellung von 178-195 bedingte eine große anzahl von kleineren plattenfehlern, druckzufälligkeiten, und druckmängeln. Katalogisiert werden nur markante abweichungen; eine Komplette auflistung würde den rahmen auch eines spezial-kataloges sprengen! The hurried printings of Mi. 178-195 caused a large number of minor plate errors and printing irregularities. Only prominent varieties are listed; a complete listing would be beyond the capacity of this specialized catalog. I would definitiely categorize it as an uncataloged plate or printing variety though. You may want to do a study of this set. Maybe get mint copies showing the lack of the dot, blocks etc. showing types of dot varieties, and so on. If it is a plate variety, then you could look for multiples that show the progression of the plate fault. There are probably books and philatelic articles somewhere on specializing in Bavarian / German States stamps. No doubt they are probably published in German as well. Why does the Bavarian 20pf blue (embossed arms issue, perf) so often look distinctly lilac, if not even purple. I have seen all shades of this stamp from purplish-blue through to out and out purple. Are these purple stamps colour changelings or due to a special printing? Apparently there are a whole range of shades. The Michel specialized lists the normal color shades as gray blue, Prussian blue, and ultramarine (color range anywhere from dark grayish to dark violet ultramarine). Your stamp may be somewhere in the shade range from dark grayish to violet ultramarine, which would look purple. The costly ones are the grayish blue and the Prussian blue. The ultramarine shades are the commonest. Unless the stamp looks like it’s been cleaned or bleached, I wouldn’t think it a changeling. Changelings usually come from blue green stamps, which can become a light blue color, due to the pigment, as is the case with one of the GB 1/2 P. Victorian stamps. I AM LOOKING FOR A CATALOGUE THAT TELLS ME WHAT POST OFFICE THE NUMBERS IN GERMAN CANCELLATIONS REPRESENT. FOR EXAMPLE 220. THANKS. This is a very challenging area of German States stamps. There are different PO numerals for each of the states, and in some cases, the same numeral, based on the period of usage, can indicate different towns. I am sure this information exists in specialist circles, but it may be extremely difficult to locate, especially if one is doing English language searches for the information. A few years ago, I bought a large dealer stock from a seller in Germany, and included in the shipment was a hard-bound two volume set of German language books called .... “Großes Lexikon der Philatelie I & II, by Hăger”, 1973 Ed. .... or “Extensive Dictionary of Philately” in English. A picture of the front of Volume II is shown here. This is a very nice dictionary of German language philatelic terms. At the back of Volume II, in the appendix, is a 32 page section on “Die Nummernstempel der altdeutschen Staaten” ... “The Cancellation Numerals of the Old German States”. I have found this very useful in my collecting of German States stamps. I put the Thurn & Taxis numbers on the website, in pasted sections, however I can’t actually copy the pages and post all of the contents on the website, due to the international copyright laws. 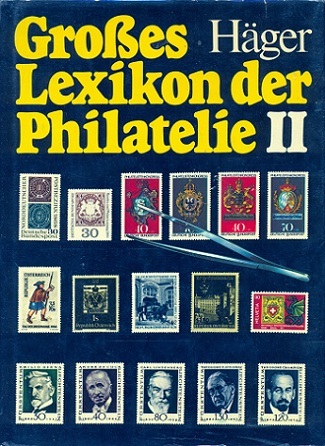 I was able to locate a German company on the internet that has some of them for sale .... Here’s the link ..... Großes Lexikon der Philatelie You may be able to find the set, or at least volume II, by searching elsewhere on the German language name of the book or on the author’s name. You might also try searches on altdeutschland, stempel, or nummernstempel for other books on this subject, as well. I would like to send images of cut-squares from Hamburg that are embossed, w/"post-couvert" & value in small type across paper, or if you don't need image, are you familiar with these? This is part of an imprint with post-couvert and the denomination of the stamp. It is in French, as French is the official language of the Universal Postal Union. In this case, it translates to “postal-cover [of a particular denomination]. This imprint was used on postal stationery issues of some of the old German kingdoms. The most common ones are from Hamburg. This cut-out stamp is not from a printed sheet but from a postal stationery envelope – stamped envelope. Foreign postal stationery stamps, cut from envelopes or postal cards – what we in the US call “cut squares” -- have very little value, but they are occasionally collected, along with the other sheet-printed or coil-printed stamps of the particular country. 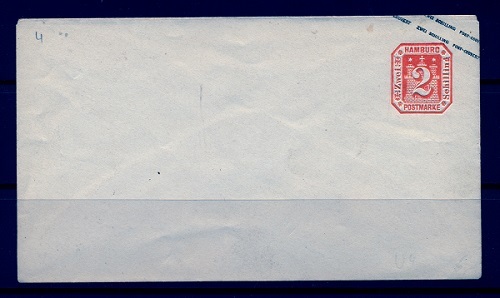 Entire envelopes, either mint or used, do have value, and they are usually listed in specialized catalogs.